Lay out the 16 Place tiles in a 4x4 grid. This is 1 considered the game board. When playing for the first time, we recommend you use the "Short paths" layout, in which the Place tiles are laid out according to their blue numbers as shown below. 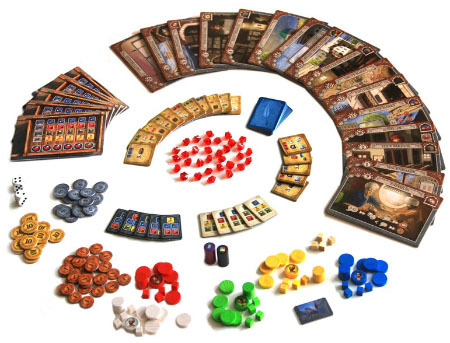 Note: In a 2-player game: place the Merchant discs of the unused colors on the Mosques 14 15 and the Gemstone Dealer 16. Randomly determine a Start player. He gets 2 Lira and the Starting player marker. In clockwise order, each other player gets 1 more Lira than the player to his right. Then each player draws a Bonus card from the top of the stack. Sort the Mosque tiles by color and then by their number of goods symbols in 4 stacks (so that the tile on top of each stack shows 2 symbols) and place them on the two Mosques 14 15. Place 1 Ruby per player on each of the Mosques. Note: With 5 players: Only place 4 Rubies on each of the Mosques. With 3 players: Remove the tiles with 5 symbols from the game. With 2 players: Remove the tiles with 3 and 5 symbols from the game. Per player, place 1 Ruby and 3 Wheelbarrow extensions on the Wainwright 1. Place Rubies on the Gemstone Dealer 16 and the Sultan's Palace 13 beginning with the top space on the right. Continue to the space for the appropriate number of players. Place 1 Ruby on each space and leave the remaining spaces empty. Place the Mail indicators in the top row of the Post Office 5. Shuffle the 5 dark Demand tiles and place them face-up in a stack on the Large Market 10. Repeat this procedure for the Small Market 11 using the light Demand tiles. Determine the starting Places of the Governor and the Smuggler. For each of them, roll both dice and place the token on the Place tile with the appropriate number. Shuffle the Bonus cards and place them face-down in a stack as well as the coins and dice next to the game board. Each player chooses a color and takes the wooden components in that color. Also, take a Wheelbarrow and an Overview and place them in front of you. Place the 4 Goods indicators on the grey spaces of your Wheelbarrow. Place your Family members on the Police Station 12. Stack your 4 Assistant discs and place your Merchant disc on top of this stack. Then place these stacks on the Fountain 7. Place the 5th Assistant of each player easily accessible next to the game board. Beginning with the Start player you take turns in clockwise order. When the first player has collected 5 Rubies (in a 2-player game: 6 Rubies) on the appropriate spaces of his Wheelbarrow, you complete the current round. After this round the game ends. A turn consists of 4 phases but, most of the time, only the 2 phases "Movement" and "Action" are actually played. 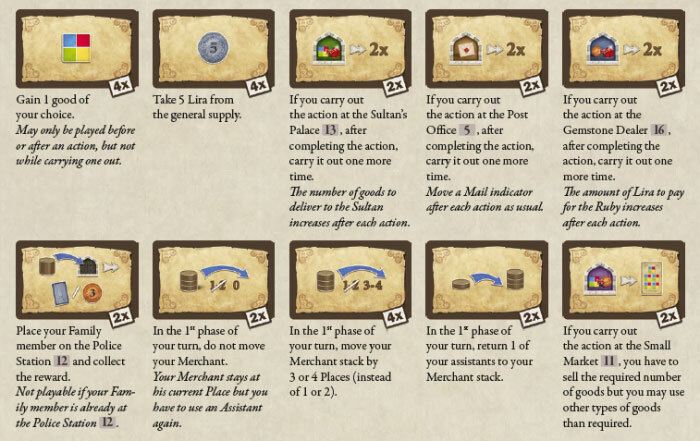 The other phases, the so-called "Encounters"(blue background below), will only take place when your Merchant encounters other tokens. 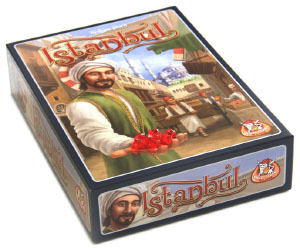 On your turn, you may use any number of Bonus cards and the special abilities of your Mosque tiles. You must always go through the following phases in the given order regardless of whether you go through all of them or not! If one of your Assistants was present at the target place already, put your stack on top of that Assistant (see fig. on the right). He will leave that place as part of the stack during the next Movement phase. If none of your Assistants was present at the target place, remove the bottommost Assistant from your stack and place him next to it. He will be left behind at that place during the next Movement phase. If you cannot or do not want to pick up an Assistant or leave one behind, your turn ends immediately (exception: Fountain 7). 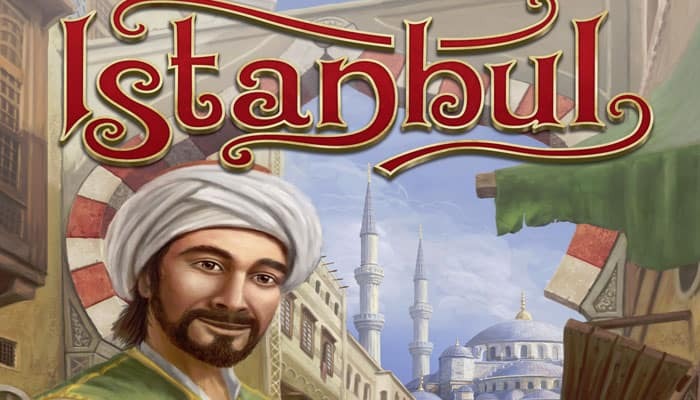 Note: If you have the yellow Mosque tile, you may pay 2 Lira to take an Assistant back from another Place and add him to your Merchant stack. If there are any other Merchants at the Target Place, you have to pay each of them 2 Lira. Your turn ends immediately if you cannot or do not want to pay. Exception: You don't have to pay other Merchants at the Fountain 7. 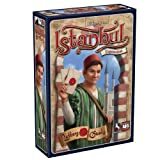 Special case in a 2-player game: If you encounter a neutral Merchant (ie of an unused color), pay the 2 Lira into the general supply. Then roll both dice to determine a new position for this neutral Merchant and place him there. You may carry out the action that the target place provides. If you cannot or do not want to carry it out, you may proceed with phase 4 (Encounters). If there are other players' Family members at the Target Place, you must catch them and send them all to the Police Station 12 (unless they are there already). As a reward for catching them, you may take 1 Bonus card or 3 Lira from the general supply for each such Family member. If you catch more than 1 Family member, you may take a different or the same reward for each of them (you do not get any reward in the Police Station). You may draw 1 Bonus card from the face-down stack and put it into your hand. If you do, either pay 2 Lira or discard 1 Bonus card from your hand. You may gain 1 good of your choice. If you do, either pay 2 Lira or 1 good. If you used the ability of the Governor or Smuggler, roll both dice and place the appropriate token on the Place indicated by the result of the dice roll (according to the large brown number). Roll separately if you used them both. Note: You may discard the Bonus card or pay the good you received from the Governor or Smuggler in order to move them. On your turn, you may play any number of Bonus cards. Place every used or discarded Bonus card on the face-up discard pile on the Caravansary 6. When taking a Bonus card, draw it from the face-down draw pile (exception: Caravansary 6). Shuffle the discard pile to form a new face-down draw pile as soon as the draw pile runs out. You may keep any number of Bonus cards in your hand. Pay 7 Lira into the general supply to take a Wheelbarrow extension from the Wainwright and place it in your Wheelbarrow. As soon as you complete your Wheelbarrow, i.e. once you have extended it for the 3rd time, immediately and only once take 1 Ruby off the Wainwright and place it on your Wheelbarrow. Move the Goods indicator of the respective good as far to the right as possible. If you have the green Mosque tile, you may pay 2 Lira to gain 1 additional good of any type. You receive the resources that are depicted on the 4 uncovered spaces. Then move the leftmost Mail indicator of the top row down to the bottom row. If all Mail indicators are already in the bottom row, move them all back to the top row. Example: You receive 3 Lira, 1 yellow and 1 red good. Then you move the Mail indicator off the blue good onto the yellow one. Take 2 Bonus cards into your hand and discard 1 Bonus card from your hand. Note: When taking Bonus cards with this action (and only with this one), you may also take them from the top of the face-up discard pile. Return any number of your Assistants to your Merchant stack. The Fountain is the only Place where you do not need to have an Assistant there to carry out the action and you do not have to pay other Merchants if they are present. If you send your Family Member to the Fountain, your Assistants are still returned to your Merchant stack. Gain 1 red or 1 yellow or 1 green good. Roll both dice: If you rolled 7 or 8: Gain 1 blue good. If you rolled 9 or 10: Gain 2 blue goods. If you rolled 11 or 12: Gain 3 blue goods. You may also roll the dice first and gain the one additional good afterwards. If you have the red Mosque tile, you may turn one die to "4" after the roll or re-roll both dice. Announce a number between 3 and 12. Then roll both dice. If you roll equal to or greater than the announced number, take the announced number of Lira from the general supply. Otherwise, only take 2 Lira. Sell 1-5 of the goods that are depicted on the Demand tile. Move the Goods indicators on your Wheelbarrow accordingly. Then take the revenue from the general supply according to the table. Finally, move the current Demand tile to the bottom of the stack. If your Family member is in the Police Station, "free" it and send it to another Place. Then carry out the action of that Place. Your Family member does not have any encounters. While at other Places, your Family member may be caught by other Merchants and sent back to the Police Station. As a reward, the catching player will get 1 Bonus card or 3 Lira. Deliver all the goods that are not covered by a Ruby to the Sultan. As a reward, take the next available Ruby from the track and place it on your Wheelbarrow. Consequently, the next Ruby will be more expensive. Take 1 Mosque tile. To do so, your Wheelbarrow must carry the goods that are depicted on the Mosque tile in the required quantities. Then pay 1 of the depicted goods. Each Mosque tile provides a special ability (see below or blue texts). You may only have one copy of each tile. As soon as you acquire both tiles of one Mosque, immediately and only once take 1 Ruby from that Mosque and place it on your Wheelbarrow. Pay a number of Lira into the general supply equal to the biggest number that is not covered by a Ruby. Then take the next available Ruby from the track and place it on your Wheelbarrow. Consequently, the next Ruby will be more expensive. Example: The biggest number that is not covered by a Ruby is 15. So you have to pay 15 Lira to get the next Ruby from the track. At the Tea House 9 and the Black Market 8 , you may turn 1 die to "4" after the roll or re-roll both dice (1x). Immediately take the 5th Assistant of your color from the general supply and place him under your Merchant. When using one of the three Warehouses 2 3 4 , you may pay 2 Lira to gain 1 additional good of any type. Once on your turn, you may pay 2 Lira to return an Assistant to your Merchant stack. The first player to collect 5 Rubies (in a 2-player game: 6 Rubies) triggers the end of the game. When this happens, complete the current round. 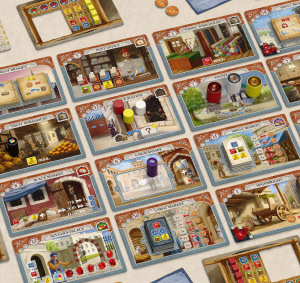 Then each player may use his leftover Bonus cards that provide goods or money. This may matter for the tie-breaker. The player with the most Rubies wins. Ties are broken in the following order: most leftover Lira, most leftover goods on the Wheelbarrow, most leftover Bonus cards. If these have not resolved the tie, there are multiple winners.